The cycle will be performed at 2:00 p.m. on May 8th (Mother’s Day) and 15th, 2005 at Weill Recital Hall at Carnegie Hall. The performance will feature baritone Richard Lalli and pianist William Braun. 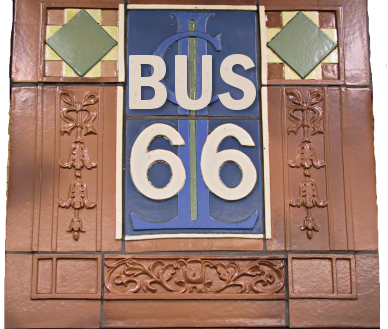 Bus 66 began as a small set of songs that were performed individually at Joe’s Pub at the Joseph Papp Public Theater in New York. They appeared as part of a cabaret series sponsored by the new music group, Sequitur. The first song written in this collection was The Ticket, a piece originally written for a Sequitur cabaret whose theme was "money." Each performance has seen the addition of one or two songs, new passengers on a collective journey. And when the cycle is performed this May at Weill Recital Hall, the set of eighteen songs will contain two songs written just for the occasion. A frequent bus rider and ardent advocate of public transportation, composer Francine Trester attended the Juilliard Pre-College Division as a violinist and received her B.A. at Yale University. As a violinist, she has been a student of Syoko Aki, a member of the Alexander Schneider N.Y. String Orchestra and a Tanglewood Fellowship recipient. Later pursuing her compositional studies with Jacob Druckman and Martin Bresnick, she received the M.M., M.M.A. and D.M.A. degrees in composition at the Yale School of Music. In 1994, she received a Fulbright Scholarship to study composition in England with Alexander Goehr at Cambridge University. A self-taught pianist, she also worked as an accompanist and Assistant to the Directors of Live Wires and Live Culture at the English National Opera, and as Composer-in-Residence at the Queenswood School. Upon her return to the United States in 1996, Trester assumed a position as Assistant Professor in Music at Austin College. In 1998, she received the ASCAP Foundation Morton Gould Young Composer Award. She has been commissioned to write for baritone Richard Lalli, the Mirror Visions Ensemble, the Arianna String Quartet, the Yale Collegium Musicum, trumpeter John Holt (University of North Texas), soprano Patricia Prunty, and mezzo-soprano Mary Ann Hart. Additionally, she has written for faculty at the University of Akron, West Texas A&M University, Austin College, soprano Jayne West, and contralto Elizabeth Anker. Recent performances of her works include premieres at Florence Gould Hall, the Kosciusko Foundation and the Joseph Papp Public Theater. Her compositions have also recently been performed at Yale, Wesleyan, and Tufts University, M.I.T., the Longy School of Music, the First and Second Church in Boston, Old First Church in San Francisco, on KALW radio in San Francisco and WGBH radio in Boston. Recordings include a performance by the Mirror Visions Ensemble on the Albany Records label, and a trumpet composition for John Holt on Crystal Records. 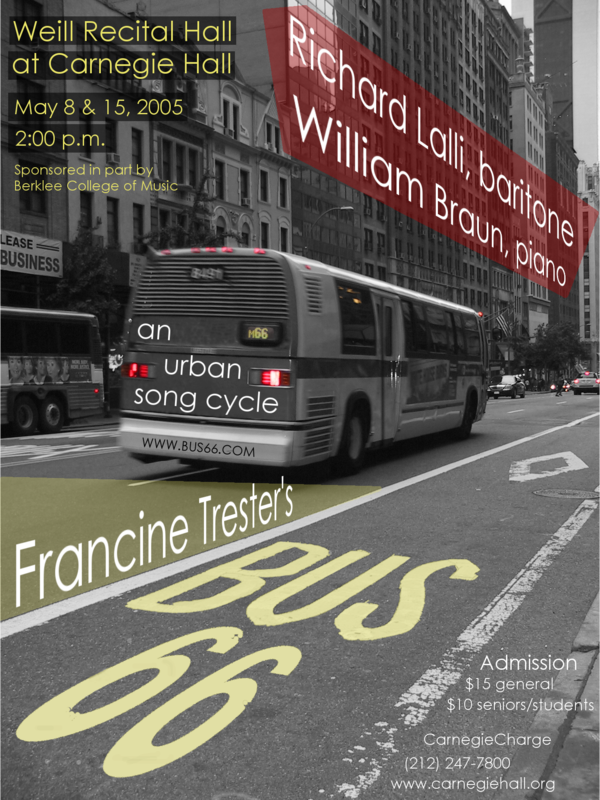 Trester was a faculty member of the Yale School of Music from 2000-2002. She later served on the faculties of the Longy School of Music and Tufts University. 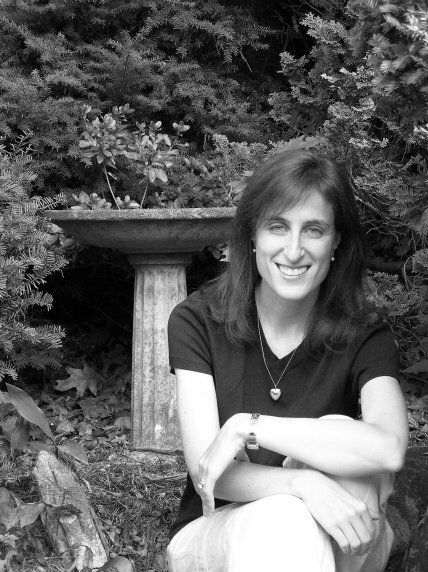 Currently, she is an Associate Professor of Composition at Berklee College of Music. This year, as a member of the Boston based new music group Composers in Red Sneakers, she received a commission from the Fromm Music Foundation at Harvard University. Baritone Richard Lalli is an Associate Professor of Music at Yale University, where he has taught since 1982. He currently conducts the Yale Collegium Musicum, an ensemble devoted to early music and started by Paul Hindemith in the 1940’s; the Collegium regularly performs works from manuscript in the Beinecke Rare Book and Manuscript Library in New Haven. Mr. Lalli performs around the world as a singer. He has given solo recitals at Wigmore Hall, the Spoleto Festival USA, the National Gallery of Art in Washington, Merkin Hall in New York, Salle Cortot, and the United States Embassy in Paris. During the Schubert bicentenary year the baritone presented the three Schubert cycles at Yale University, the Norfolk Chamber Music Festival, and in Paris. During the past few seasons he has been particularly active in the performance of chamber music. He has performed Schoenberg's Ode to Napoleon on the Lincoln Center Chamber Players series at Alice Tully Hall, and has appeared with the Boston Camerata, Orchestra of St. Luke’s, the Arcadia Players, Sequitur, and ARTEK. As a pianist he has participated in chamber music programs with the Mirror Visions Ensemble in Weill Recital Hall, Town Hall, and in Paris, London, Stockholm, Basel, Edinburgh, and Budapest. In recent seasons Lalli has premiered works of Yehudi Wyner, Kathryn Alexander, Tom Cipullo, Christopher Berg, Richard Wilson, Lewis Spratlan, Francine Trester, Ricky Ian Gordon, Richard Pearson Thomas, Eric Zivian, Braxton Blake, Daron Hagen, Juliana Hall, Matthew Suttor, John Halle, and William Ryden. This past season Mr. Lalli performed William Walton’s Façade with the composer’s widow at Yale University. At Princeton he was featured in the one-man chamber opera Cézanne’s Doubt, by Daniel Rothman. In May he sang premieres by Robert Carl, Steven Cox, Elana Kats-Chernin, Robert Maggio, and William Rhodes at Joe’s Pub in New York City. And in June he gave the American premiere of a new one-man performance piece, ME, by Edmund Campion, at the Cal Performances Edge Festival in Berkeley. Additionally, he sang Schubert’s Winterreise at Mount Holyoke College, Wolf’s Italienisches Liederbuch at Smith College, and Kurtag’s Four Songs Composed to János Pilinszky’s Poems at Columbia. He also presented six concerts at the Musée Carnavalet, the museum of the city of Paris, featuring a song cycle by Christopher Berg based upon the letters of Madame de Sévigné. With pianist Gary Chapman, Lalli has recorded four discs of popular songs. The two have appeared at festivals around the world, and also in intimate spaces such as the Players' Club, the Carlyle, the Park Plaza, and The Whitney Museum of American Art. Their recording accompanies a new Yale University Press publication, Listening to Classical American Popular Songs, by Allen Forte. Lalli is a graduate of the Interlochen Arts Academy, Oberlin Conservatory, and Yale School of Music. Pianist William Braun has appeared as soloist with the Florida West Coast Symphony, the Waterbury Symphony and Orchestra New England. He has performed on three occasions with the New World Symphony in Miami, in music by Perle, Ives and Ruggles. He is heard on the Koch Classics recording of the Griffes ballet the Kairn of Koridwen, and performed the work with the New World Consort at the Kennedy Center. He recorded soundtracks for two episodes of the PBS television series American Masters, and is noted for performing Messiaen’s Vingt Regards sur L’Enfant-Jésus in a single evening. This performance of Bus 66 is sponsored in part by Berklee College of Music. Tickets for both the May 8th (Mother’s Day) and 15th concerts are $15 general and $10 seniors/students. 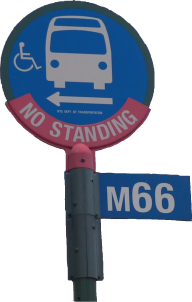 Be sure to take your mother for a ride on Bus 66 this Mother’s Day—tickets make a great gift and can purchased through CarnegieCharge (212) 247-7800, www.carnegiehall.org. All songs on this page are Copyright © 2005 by Francine Trester. All rights reserved. All texts on this page are Copyright © 2005 by Francine Trester. All rights reserved.